Cooking great food in the outdoors with friends and family is one of the simple joys of camping, it just somehow tastes better. There’s just nothing quite like sitting around the fire with the sizzle and smell of the evening meal on the grill. You will be amazed what is possible with a few basic ingredients, a couple of good recipes and a sense of adventure. Here are a few of our favourite recipes, all tried and tested by the Long Valley Yurts team. A special thanks to Cool Camping and Martin Dory and Sarah Randell for their recipes, they’re great and super tasty. Please feel free to download a copy of the recipes try them at home and bring them away with you on your holidays. 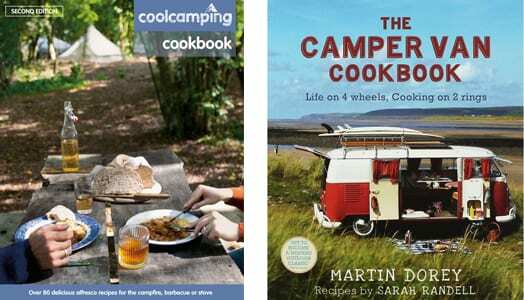 Available in the simply superb The Camper Van Cookbook by Martin Dory and Sarah Randell and the Cool Camping Cookbook by Punk Publishing . Good for simple delicious recipes both at home or away. This is essentially a hash – a comforting mush of leftover flavours to get your day going. Ideal when staying in the Yurts or Bell Tents to get those leftovers used up. Not exactly how Mamma used to make it – but then Mamma had a well-stocked kitchen, large wine cellar and a goat called Alfredo tied to a lemon tree to help her and probably a large Pizza oven. Pah. A firm favourite in the Caribbean, with recipes handed down through the generations. Deliciously simple, adjust yours to make a signature camping dish for your family and friends. Great with corn on cob, BBQ style. A staple camping dish. So easy to make it will become a firm favourite at home and on your holidays. Just great on the BBQ with some vegetable skewers. Quick to make and is just perfect with a fresh loaf of crusty bread. Hmm I can almost taste it now. Just great after a busy day out. Make it extra special with some locally sourced sausages from the butcher. You can’t go camping and not have a burger. It’s the rules. Nothing better than fresh home made burgers, cooked to perfection on BBQ. Spice lovers can add a pinch of crushed dried chillies if they fancy. You couldn’t come and stay in the Yurts without cooking a Moroccan Tagine, it just wouldn’t be right! It’s also remarkably easy. Easy, tasty, creamy, fruity, zesty, zingy lemon pud. Each of the Yurts comes with its own trusty old two-ring stove with grill. It’s amazing what you can create with a little pre-planning and imagination. Each of the Yurts comes with a wood burning stove with hot plate, great for cooking on and you can use the fire box for baked potatoes or corn on the cob. Why not challenge yourself one evening and cook everything on the wood burner. Bon appetite! It would be great to see your culinary skills please feel free to take photos and download to onto our Facebook page. All you need to cook and dine is supplied inside the Yurts and Bell Tents. Here is a list of the essentials we recommend, add or amend it to take into account your favourite ingredients.